Written by Alan Alda and Walter D. Dishell, M.D. Capsule Summary: Hawkeye and B.J. only have 20 minutes to save a patient. They desperately need an aortic graft and must wait for another soldier to die so their patient can live. Decades before FOX debuted 24, an action drama that unfolded in “real time,” M*A*S*H experimented with this unconventional episode. Like earlier experimental episodes “Hawkeye (Season 4) or “Point of View” (Season 7), “Life Time” is an episode most fans and even many casual viewers are familiar with, simply because it was so unusual. It also happens to be quite good. The opening scene in which Hawkeye, B.J., Margaret, and Klinger play poker while waiting for a chopper to arrive is a little bizarre. Perhaps it was intended to set the tone for viewers, implying that this would be a light and funny rather than then dark and tense. It just makes no sense to be playing poker at the chopper pad. The cards and money are blown away the instant the chopper approaches. Once the chopper lands, the episode takes a drastic turn away from light and funny. There’s a soldier with an open chest wound in such bad shape–his aorta has been lacerated–Hawkeye has to reach in and compress the aorta against the spinal column to stop the bleeding. It works but the doctors only have 20 minutes to operate before the soldier risks being paralyzed. To increase the tension and remind viewers of the real time nature of the episode, a stopwatch graphic appears on the lower right. To be honest, I didn’t much attention to the stopwatch because I was too busy watching the episode. The ride from the chopper pad is incredibly well done, with Hawkeye yelling instructions and various people running off to gather blood and clamps and grafts. The stopwatch doesn’t pause for a commercial break; it jumps from 1439 to 1445. It dramatically lingers for a few seconds before the break and returns a few seconds before the episode resumes. “Life Time” succeeds in large part because there’s only one storyline. Every character is connected to it. Some play much larger roles. Hawkeye and B.J. are the primary players here, working on opposite ends to keep the soldier–whose name we eventually learn is George–alive. There are two moments in the episode where things get slightly too melodramatic for me, both of which involve B.J. The first comes when he steps outside the bus and talks to Roberts. The timing is too perfect. B.J. has just told Father Mulcahy how awful he feels waiting for the dying soldier to die and then the soldier’s friend convenient comes along to make B.J. feel even worse. Dear God, I’ve never asked you for this before and I don’t know what you’re going to think of me for asking now. But if you’re going to take him anyway, please take him quickly so we can save the other boy. Charles giving blood was a brilliant way to give him something to do other than stand around and make snide remarks. He may be a snob but he donates regularly and helpfully tries to talk Hawkeye through the aorta transplant. I wonder if any other endings were ever considered. Hawkeye can’t believe they couldn’t beat the clock. “Life Time” was written by Alan Alda and Walter D. Dishell, M.D. Dishell served as Medical Advisor on M*A*S*H.
I realize they were operating on a dead body but why weren’t B.J. and Nurse Jo Ann wearing gloves while they were removing part of Harold’s aorta? Kevin Brophy, who played Roberts in this episode, later went on to guest star in three episodes of Trapper John, M.D. as well as an episode of AfterMASH. Gary Burghoff receives an “Also Starring” credit during the opening credits. Mulcahy was going to the chopper pad to check with the chopper pilot if he had any blood of the type they needed for George because Hawkeye did not want to give him too much type 0 blood. The conversation takes place in the OR. I also liked this episode and think it’s one of the better ones from when the show turned into “the Alan Alda show”. I do agree wit R.J. though that the opening scene of Hawkeye, B.J. & Margaret playing poker on the chopper pad was ridiculous. I remember when this episode first aired they kept the clock on the screen counting down the seconds during the commercials. I just have one complaint about the episode though. It would have been better if they didn’t have any commercials. A great episode with no bad parts to it. Klinger: (imitating Col. Potter) What in the name of sweet Fanny Adams is going on there? Can we expect casualties or not? Now, the next time you get a call from Cpl. Klinger, COOPERATE!!! When you’re talking to him, you’re talking to me. Quite possibly, Klinger’s most hilarious line. BJ: We made a man that’s part Harold and part George. Hawkeye: That’s right. When he wakes up, he won’t know whether to be brave, generous, or pompous. A fitting final salvo from the men of the Swamp. This is a very innovative and enjoyable episode. Not much else to add, except that I agree that playing poker at the chopper pad was pretty strange (it probably was done to throw the viewers off). And I hope that George didn’t develop an infection since no one scrubbed or had masks on! I am a fan of this episode immensely. Very fast paced and it managed to mix some humor in with the serious. I liked when Hawkeye was describing where he hid the clamps and Margaret’s “what the HELL are they doing in the Swamp” line before it. Great great episode in my opinion. I noticed it too, so I asked a transplant surgeon that I used to work with about it. He said taking donations from an already deceased patient was not considered a particularly sterile procedure when grafting was first developed in the 1950s. Up until the mid-1980s, gloves weren’t used very effectively when they were used at all. I can remember nurses placing IVs, changing colostomy bags, etc. while not wearing gloves. The AIDS epidemic changed that dramatically. I really liked the ending, learning that the operation was a success. I realize M*A*S*H is fiction and that this would never be possible, but I wish M*A*S*H could have followed the patient after discharge to see how long the transplant lasted without anti-rejection drugs. Actually something similar was done apparently according to Dr Walter Dishell who advised on medical matters for the show. The episode was co-written by Dr Dishell and the episode was his idea so I’m thinking it’s as accurate as any TV show can hope to be. I’m always skeptical of things on the show too but apparently the later the season the more accurate. Father Mulcahy was headed to the chopper pad to see if the chopper had any extra units of a b negative for the patient. I’m watching the episode now. Who is the actor that played George? 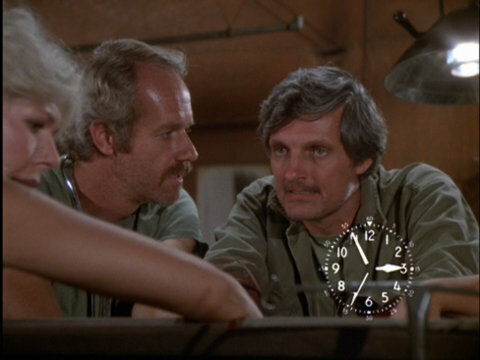 I think it is the blond corpsman that has a recurring role in Mash?? Noticed that, too. It did look suspiciously like Bill Snider. Great episode and interesting concept. I recently heard Dr Dishell talk about how it came about and the writing of it with Alda. He talked about the medicine behind it and how some of his ideas didn’t work for the show. At any rate, in some ways I wish it was a longer episode. BJ walking into the truck and getting instantly attached to the dying soldier fell flat for me. I know it’s tough when anyone dies but I can’t imagine doctors getting emotional and attached to every person who rolls into a hospital that is unsavable. If anyone should be upset it should be Potter since he tried to save him. BJ getting all emotional was unlike a person who sees this type of thing for a living. On the other hand, I thought it was quick thinking on his part to suggest the transplant from the patient. Very realistic episode all in all. I also wonder why Klinger would barge in and shout insensitively in front of other wounded soldiers, “Hawkeye wants to know when he’s DEAD!” He behaved like he was at a ball game talking about hot dogs instead of discussing a dying American soldier. When he dramatically looked at BJ and said, “I hope I didn’t say anything wrong,” BJ should have turned to him and screamed, “you certainly did! Can’t you ever shut your fat mouth?” It was clearly a plot device to let the soldier’s friend know about the transplant but it was very obvious and forced.